One of America’s best Beach Boys’ tribute bands! 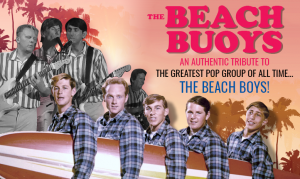 Don’t miss this authentic tribute to the greatest pop group of all time…The Beach Boys! From the tight vocal arrangements to the striped shirts and the authentic, vintage guitars and amps, The Beach Buoys have done the research to effectively recreate a live Beach Boys performance from the mid 60’s, and have even performed alongside Surf legends, Jan and Dean, The Beach Boys Band, and The Wrecking Crew. Their vintage guitars, amplifiers, and drums are the same as The Beach Boys used on stage. And equally important, The Beach Buoys’ members aren’t just seasoned musical pros, they’re also fans; fans of the Southern California Surf scene, the Hotrod lifestyle, and the music that set the tone for the rest of the country to jump on board! Driven by their love, respect, and passion for the era, The Beach Buoys have succeeded in replicating the sound, look, and the vibe of the boys from Hawthorne! Saw them a few months ago at Wellington Amp. Very good act.